The Cadiz Brushed Steel Stool Black is ideally suited to those who appreciate utterly exquisite furniture. This classy item unites efficiency with understated visuals. Combining a supportive seat with sophisticated style, the Cadiz is a delightful designer choice. Its focal point is a padded faux leather seat, which brings comfort and class together with ease and panache. An angular rim traces the underside of this component before descending into an artful footrest. 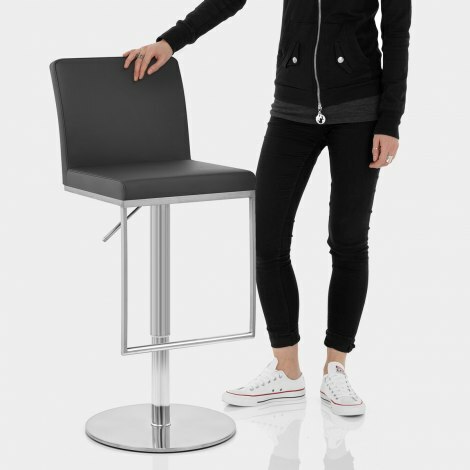 In addition to this, a brushed steel finish characterises the stool from top to base. Finally, protective pads on the underside in an effort to keep your floors free of marks.